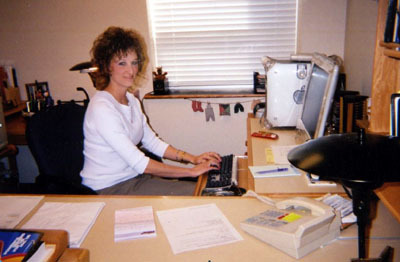 Bobbi Robison typing the SSRTA Newsletter. Bobbi and JD Robison grew up in Port Matilda and now reside in Julian. They have been members of the Snow Shoe Rails to Trails since 1999. They have two children. Courtney attends Bald Eagle Area High School and Hunter attends Wingate Elementary School. Bobbi chairs the Historical Committee and JD chairs the ATV Committee. They have participated in the Red Moshannon Canoe Race serving food and drinks, work details, and volunteered their time to help replace the bridges. Bobbi helps out with the newsletters, prepares the mailing labels, and tries to set up different riding opportunities. The Robison’s enjoy riding ATVs as a family.